For reasons unknown, the digital version of Project X Zone has been removed from the Nintendo eShop. Starting around 2012 games produced for the system typically sport a retail and digital version, with a few exceptions that are retail exclusive or vise versa. Typically the digital version would need to be loaded into an SD card, but the main benefit of choosing digital is slightly faster loading times, the convenience of not switching 3DS game cards, and the option to re-download the game at any given time. Project X Zone, the 2012 crossover for the Nintendo 3DS which threw together SEGA, Bandai Namco and Capcom characters into an epic adventure, is set to return! According to a report from website e-duessee, a sequel is in the works for the 3DS entitled Project X Zone 2: Brave New World. The article itself is a report of an April 7th Bandai Namco press event held in Milan at which the game was announced alongside another unannounced title, Saint Seiya: Soldiers’ Soul for the PS4, PS3, and PC. The original article has since been edited to remove the mentions of the games (whoops!) but thankfully NeoGAF caught it before the removal. 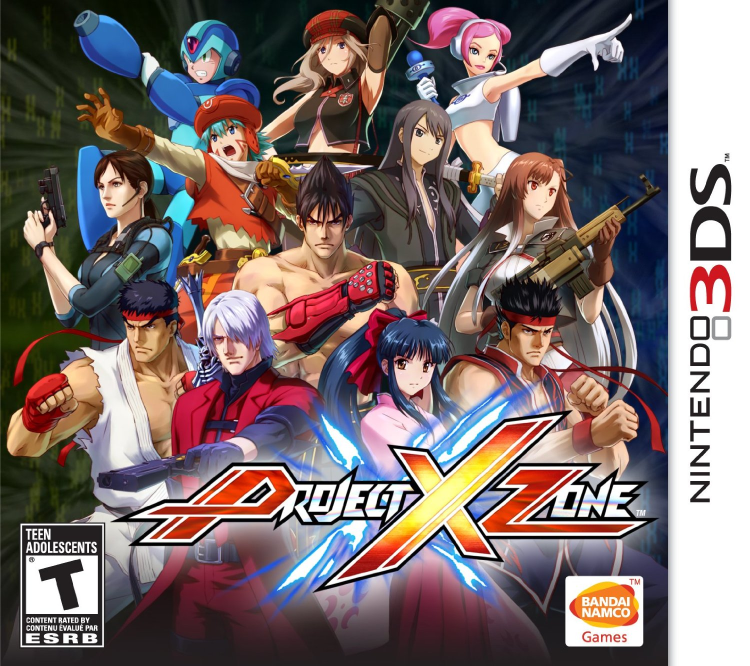 What are your thoughts on another Project X Zone title? Have any characters you’d like to see make an appearance? I’m hoping to see Mega Man, Pac-Man and Sonic, as well as an expanded SEGA cast including Ryo Hazuki and some 1980s characters. This week on the show Barry and George talk about the future of the Shenmue franchise, their take on its future and of course Project X Zone, which recently came out. Besides that we cover your weekly news, for more on whats on the show check the show notes after the break. 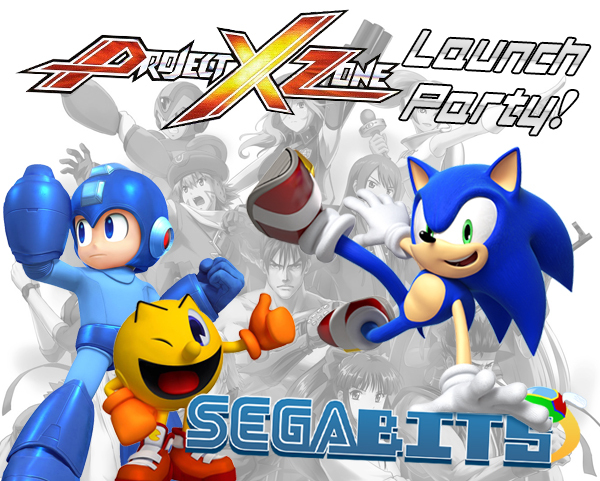 SEGAbits Event: Project X Zone Launch Party in Savannah, GA! Attention to our SEGABits readers of Georgia! My friends and I, along with my local GameStop, are teaming up to throw a launch party for the upcoming crossover RPG game of the century: Project X Zone. The game features numerous SEGA, Capcom, and Namco Bandai franchises! To celebrate this crossover, I want to invite you the launch party for the Western release of the game! Come and play games developed by Namco Bandai Games, Capcom, and SEGA that are represented in Project X Zone such as Tekken, Virtua Fighter, Street Fighter, Sakura Wars, Megaman X and more. If you would like to come in cosplay as your favorite character from Namco, Capcom, or SEGA, we will gladly take pictures and send them to the companies community pages. It’s $5 dollars to get in and receive a random raffle ticket to win a free copy of Project X Zone. The party will be held at the Applebees Restaurant near 1120 Abercorn St Savannah, GA 31419 on June 26th at 5:30pm-11:30pm. Combining your attacks is the key to victory! Hit the jump for more details. 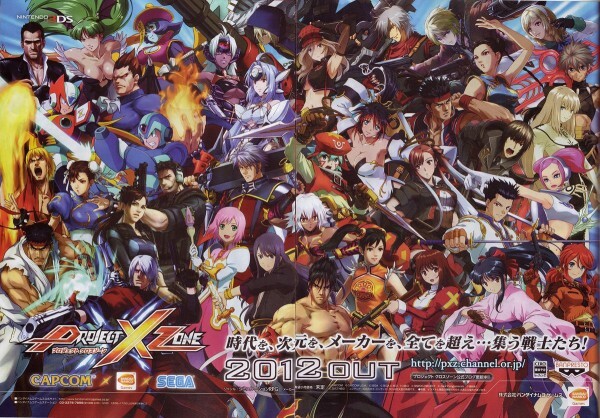 Are you excited for the upcoming Project X Zone cross-over game featuring some pretty neat SEGA characters and cameos? Well even though the Japanese port of the title isn’t breaking front pages on websites right now, they still released a new English trailer and batch of screenshots. So, are you going to get this on your 3DS when it comes out June 25th (US) and July 5th (EU)? Project X Zone 3DS demo now available in the U.S. The wait is over!….Kinda. While you may not be able to get your hands on the full game yet, the Project X Zone demo is finally in the North American 3DS E-Shop. I gotta say, playing the demo makes me want to play the full version even more! It’s fun to see the Sega, Capcom and Bandai characters interacting. Even Opa-Opa and Space Harrier make a cameo! As far as Sega franchises represented in the demo go, you’ll see characters from Sakura Wars, Valkyria Chronicles 3 and Space Channel 5. The game itself is a grid based turn style RPG with cool, interactive attacks including Marvel vs. Capcom-like 3rd character support. While the game is translated into English text, the voices are purely Japanese. But heck, a lot of folks like it that way. Note this is demo A. Which means, like Europe, a second demo should be coming soon. Project X Zone will be available in American stores on June 25th. Capcom-Unity in collabration with Namco Bandai Games and SEGA West are hosting a fan art contest for Project X Zone, which is set be released on June 25 in the US and July in Europe, to have your favorite Capcom character dressed as another character from Namco or SEGA. Will someone draw Jin from Cyberbots in Ogami Ichiro’s outfit from Sakura Wars, Frank in Bruno Dillenger’s attire from Die Hard Arcade (Dynamite Deka in Japan), or go all out drawing Felicia with Sonic the Hedgehog’s gloves and shoes? The possibities are endless! The contest runs from today through Friday May 31, 9pm PST and Capcom-Unity will pick up to 3 winners for the limited edition of Project X Zone. There’s also another contest if anyone is attending MCM Expo this year for cosplaying as one of the cover characters in Project X Zone. 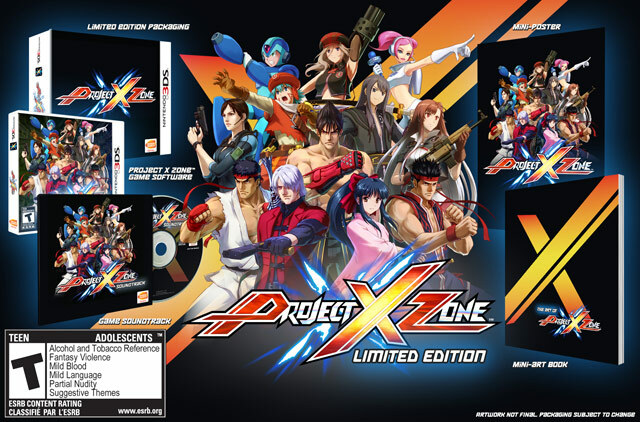 Did you know if you pre-order Project X Zone, you will get the limited edition version for free? Yep, the first printing run of Project X Zone comes in a neat case, soundtrack, mini-art book, and a mini-poster to hang on your man cave. Not sure if this is a Gamestop exclusive, but it was the only site that I found the ‘limited edition’ version. Amazon hasn’t even updated the release date (since it was delayed or have box art up). 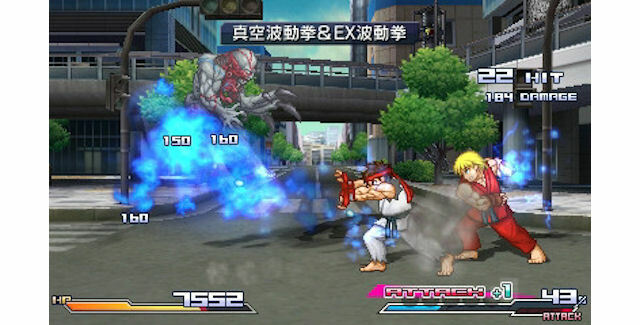 Project X Zone is being published by Namco-Bandai, but will cross over with Capcom and SEGA. As you can see from the trailer they didn’t add any new characters. You’d think them sneaking Sonic the Hedgehog would have sold a few more copies, right? So what does everyone think of this game? Looking good? Excited? 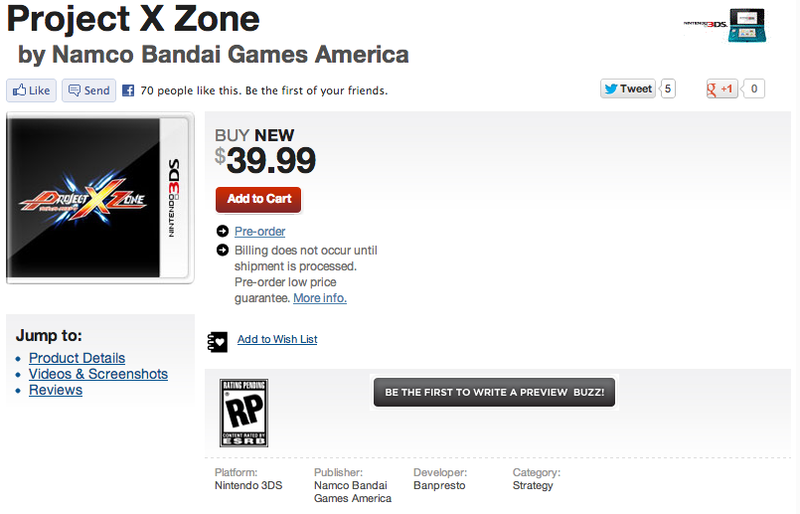 It seems that Namco-Bandai is set to publish Project X Zone in America and they plan on releasing on it June 25th. The game takes popular characters from Namco, Capcom and our dear blue SEGA . The idea is to combine them in a big RPG for the Nintendo 3DS. Looking at all those characters in the header, I’m wondering who would win in a fight: Akira Yuki vs Ryu vs Jin Kazama? I will be biased and go with Akira, how about you? Personally, I’m hoping we get the Special Edition which includes an art book and soundtrack. When further details are known, including a specific release date and potential pre-order bonuses or special editions, we’ll be sure to share the news. Now I don’t know about you, but I definitely didn’t see Project X Zone’s western release coming, especially given the fact that the last several crossover strategy games from Monolith and Banpresto never even made it out of Japan. So what better way to celebrate this crossover’s surprise localization then to post some tunes from the game? Today, we’ll be featuring the epic main theme as well as the music from the trailer, “Brave New World”. In the future, you can also expect us to feature tracks from the variety of SEGA franchises represented in the game, including Sakura Taisen, Virtua Fighter, Resonance of Fate and Shining Force EXA. Check out Brave New World after the jump. 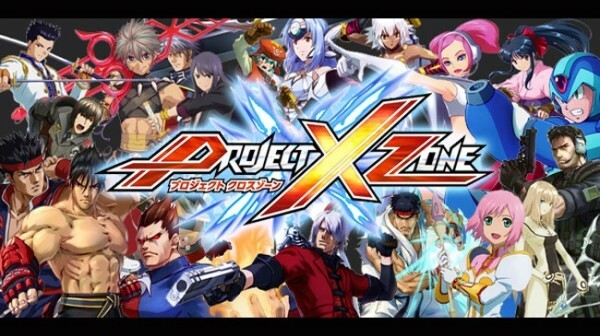 Project X Zone coming West this summer! Via IGN comes a bit of awesome news. The very-Japanese-there-is-no-way-it-is-coming-West game Project X Zone is in fact slated to release in North America, Latin America, Europe and Australia this summer! For those not in the know, Project X Zone is a SEGA, Namco-Bandai, Capcom crossover tactical RPG game featuring 200 characters from over 29 different franchises. SEGA fans who have been following the Japanese release of the game have spotted a number of SEGA all-stars including Ulala from Space Channel 5, Sakura Shinguji from Sakura Taisen and Bruno Delinger from Dynamite Deka (the full roster can be seen here). No other information, such as publisher or a possible title change, has been given, but once we learn more we’ll be sure to share it! Thanks to SEGAbits forum member CrazyTails for the heads up! Media Create has released their Japanese sales charts covering from the 8th to the 14th, which saw Resident Evil 6 on the PS3 plummeting to under 100,000 from its massive 700k+ launch. Sales of highly anticipated games in Japan tend to be far more front-loaded than that of their Western counterparts, though Resident Evil 6’s especially steep decline seems to suggest that fan reception in its homeland has been just as mixed as it has been in the West. Namco-Bandai is the publisher of Project X Zone, though the roster of SEGA characters will undoubtedly make its sales of interest to readers of this site; the strategy RPG crossover debuted at #3 with sales of 85,539, which isn’t bad. Undoubtedly facing steep competition from Square-Enix’s Bravely Default, which hit the 3DS on the same day and (predictably) took 1st place with 141,529, it will be interesting to see what these sales mean, if anything, for a Western release of the still Japanese-only title. Full charts after the break (thanks to CVG).